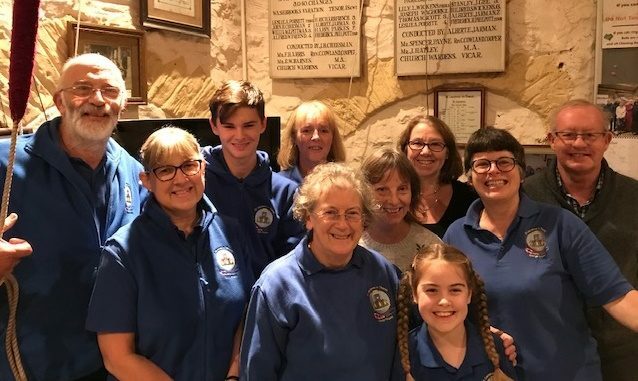 St Laurence in Thanet Bell Ringers are playing their part in Battle’s Over, an international commemoration marking 100 years since the guns fell silent at the end of World War One. Organised by Pageant master Bruno Peek, Battle’s Over takes place on November 11 with events throughout the UK, Channel Islands, the Isle of Man, and at scores of locations overseas, including New Zealand, Ireland, Australia, Bermuda, France, Belgium, Canada, the United States and Germany, to name but a few. It begins at 6am with lone pipers playing Battle’s O’er, a traditional Scottish air played after a battle, outside cathedrals in the country, following which a specially written tribute will be read out. At the same time, more than 1,000 pipers will be playing the tune in individual communities. At 6.55pm buglers will sound the Last Post and at 7pm beacons will be lit in a tribute called Beacons of Light, signifying the light of peace that emerged from the darkness of four years of war. At 7.05pm some 1,000 church and cathedrals will ring their bells as part of Ringing Out for Peace organised in association with the Central Council of Church Bell Ringers, which represents 65 societies of ringers from the British Isles and overseas. At the same time more than 140 town criers will perform a specially written Cry for Peace Around the World, the first of them in New Zealand and then across the globe through the various time zones. St Laurence in Thanet Bell Ringers will be ringing the church bells as part of Ring out for Peace at 7.05pm. Freda Parker, from St Laurence Bell Ringers, said: “We are proud to be playing a part in this historic international event to commemorate the centenary of the end of the Great War, and to recognise the contribution and sacrifice made by the men and women from our own community. St Laurence has 10 bells. Originally there were 5 bells in 1615. 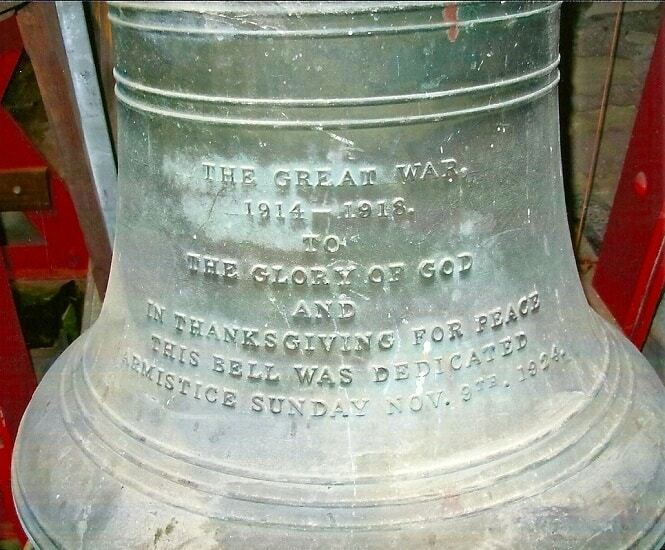 Over the centuries the bells have been recast, rehung and new bells added. 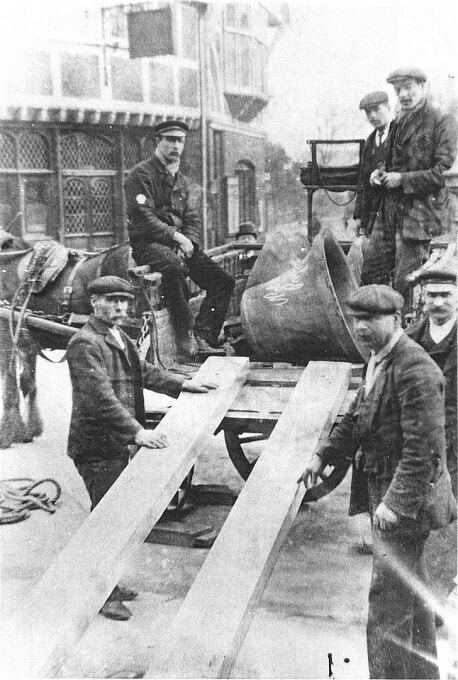 The last two bells added were in 1924 (pictured above) and were given by public donation to commemorate those lost in the Great War. The bells were hung in the church in 1924 and are inscribed to this effect. They are known as Peace and Remembrance. All Saints Church in Birchington is also joining the Ring Out For Peace at 7.05pm. Battle’s Over – A Nation’s Tribute has been devised and planned by Pageant master Bruno Peek. He has organised major royal celebrations and international events for more than 36 years and has been working on Battle’s Over for more than four years. The work of the WW1 Tunnellers has been acknowledged in a Lamplight of Peace, commissioned by Bruno Peek and lit at a special service at the Grave of the Unknown Warrior, Westminster Abbey, London, on August 4, 2018. It sheds light on a special breed of men who fought on the Western Front, digging tunnels and laying explosives beneath the German trenches. The Lamp is currently being kept alight by the event’s four official charities – Royal Naval Association, ABF The Soldiers Charity, Royal Air Force Benevolent Fund and the Merchant Navy Association – before being returned to the Grave of the Unknown Warrior, Westminster Abbey for 6am on November 11, where a lone piper from the Air Training Corps will play Battle’s O’er.